To Polarland on the "Ships starting with P" page. Tonnage: 1591 gt, 932 net, 2400 tdwt (Rohwer gives her tonnage as 1595 gt). Delivered in Oct.-1923 from Laxevaag Maskin- og Jernskibsbyggeri, Bergen, Norway (135) as Polarland to D/S A/S Vestland (Rich. Amlie), Haugesund. 246' x 37.9' x 15.7', Triple exp. (Laxevaag), 164 nhp. Managed by Rich. Amlie & Sverre Amlie, Haugesund from 1936. A Guestbook message - From a relative of one of Polarland's casualties, Sigvald A. Eide. As will be seen when going to Page 2 and Page 3, there's something peculiar in the last listing on Page 2 as compared to the dates in the first listing on Page. 3. Errors may exist; this could also mean that she may not have sailed in all the convoys mentioned here. Also, as can be seen, her 1940 and 1941 voyages are not included. *Convoy XB 8 did arrive Boston on Apr. 11, but Page 3 shows Polarland arriving New York on Apr. 12 - Boston is not mentioned. The document now lists some voyages that are missing from A. Hague's record. on to Halifax same day. (Page 3 - Also, missing voyage). July 15 Boston* Halifax July 17 BX 29 To Sydney, C.B. Sept. 23 Sydney, C.B. St. John's, N.F. Sept. 26 BW 4 For St. John's, N.F.
? * Oct. 11 New York City St. John's, N.F. Oct. 22 SC 105 For St. John's, N.F. Nov. 14 St. John's, N.F. Port Alfred Nov. 17 WB 13 St. John's to Port Alfred. Dec. 10 Sydney, C.B. St. John's, N.F. Dec. 13 BW 20 For St. John's, N.F. Jan. 26 Halifax* St. John's, N.F. Jan. 29 HJ 30 *From Louisburg. Febr. 6 St. John's, N.F. Halifax* Febr. 10 JH 35 *Arrived Louisburg. (convoy arr. St. John's, Febr. 25). March 5 New York City New York City March 7 SC 122 Returned NYC. June 1 Sydney, C.B. Argentia June 3 BW 27 For Argentia. July 15 Sydney, C.B. Argentia July 18 BW 41 For Argentia. July 21 Argentia Sydney, C.B. July 23 WB 35 From Argentia. *? July 27 St. John's, N.F. Sydney, C.B. July 29 WB 37 From St. John's, N.F. * July 28 Corner Brook Sydney, C.B. July 29 BSC 55 Corner Brook to Sydney. * One of these entries should probably be deleted. According to Page 4, she sailed from Corner Brook on July 28 and arrived Sydney, C.B. the next day. Aug. 26 Sydney, C.B. Argentia Aug. 29* BW 55 For Argentia. *Page 5 gives arrival Aug. 27. Sept. 13 St. John's, N.F. Sydney, C.B. Sept. 15 WB 53 From St. John's, N.F. Oct. 10 Sydney, C.B. St. John's, N.F. Oct. 12 BW 70 For St. John's, N.F. Oct. 19 St. John's, N.F. Sydney, C.B. Oct. 21 WB 65 From St. John's, N.F. Oct. 25 Sydney, C.B. Argentia Oct. 28 BW 75 For Argentia. Nov. 1 Argentia Sydney, C.B. Nov. 2 WB 69 From Argentia. Nov. 3 Sydney, C.B. Argentia Nov. 6 BW 78 For Argentia. Nov. 9 Argentia Sydney, C.B. Nov. 12 WB 72 From Argentia. Febr. 1 Halifax Argentia Febr. 4 HJ 80 To Argentia. Dec. 13 Boston Halifax? * Dec. 15 BX 137 *For St. John's, N.F. (Page 7 - Also, missing voyages). Dec. 24 St. John's, N.F. St Lawrence, N.F. Dec. 26 WB 149 St. John's to St. Lawrence, N.F. 1945 Jan. 3 Sydney, C.B.   SH 194 Sunk - See "Final Fate" below. As will be seen when going to Page 1 of the archive documents, Polarland left Charleston for Cuba on Apr. 7-1940, 2 days before war broke out in Norway. She later arrived Kingston, Jamaica on Apr. 14. It'll be noticed that she spent quite a long time in Philadelphia that year. She had arrived there from New York on July 8 and departure is given as Oct. 14, when she proceeded to Hampton Roads. Her 1941 voyages also start on this document - according to the memorial for seamen in Stavern, Norway (link at the end of this page), she lost a crew member early that year. 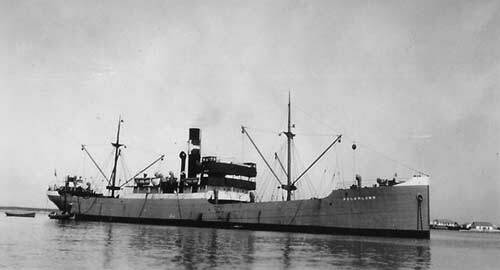 Seaman Anton Thomassen is said to have died on Jan. 25-1941 after an accident on board. From the archive document, we learn that Polarland was on her way from Mobile to Cristobal on that date. Her 1941 voyages continue on Page 2, which shows another long gap. She had arrived New York from Dingwall, N.S. on Dec. 12-1941 and the next entry shows her leaving New York for Halifax on March 15-1942. She's mentioned in a document I have for Convoy SC 76, which left Halifax for the U.K. on March 24. The document in question is based on a diary, and the author of the diary who saw her leave with the other ships must have assumed that she too was intended for this convoy, but please note that she's not included in the original Advance Sailing Telegram for SC 76 and she probably left Halifax that day for other reasons than to join the convoy. She arrived Argentia on March 28. She's also mentioned among the ships leaving Halifax to form Convoy SC 100 on Sept. 12-1942, but again, it looks like she left Halifax for other reasons than to join this convoy. In fact, according to Arnold Hague, she joined Convoy HJ 11 that day (external link), and was bound for St. John's, N.F., where she arrived Sept. 16 - see Page 3. Arnold Hague has also included Polarland in Convoy SC 105, which originated in New York on Oct. 11. Her destination is given as St. John's only, but I'm not entirely convinced she sailed in this convoy, as it does not quite match up with the details found on the archive document. She did sail to St. John's in this time period, having left Sydney, C.B. on Oct. 15, but for this voyage, A. Hague has her (together with Garnes) in Convoy LC 50 (also external page). She arrived St. John's on Oct. 19. SC 105 is not yet available among the SC convoys in my Convoys section, but will be added (see ships in all SC convoys). Bonde, Don, Far, Herma, Kirsten B, Norelg and Ramø are also listed. The following year, she was fortunate to miss what has been dubbed the worst convoy battle of the war fought in the North Atlantic. This took place in March-1943 and the two eastbound convoys SC 122 and HX 229 were involved. Gudvor, Askepot and Polarland had started out from New York in Convoy SC 122 on March 5 (Polarland's destination was St. John's), but only Askepot was present when the attacks started, the other 2 having lost the convoy in a storm and returned to port. The battle lasted for 5 days and when it was over on March 20, 22 merchant ships had been sunk, with HX 229 being the hardest hit (Abraham Lincoln was the Commodore Vessel for HX 229 in which Elin K was sunk) - only one U-boat was sunk by airplane on March 19. Please follow the links to my pages about these convoys for much more information; cruising orders and charts and an analysis of attacks are also available for SC 122. Here are the cruising orders and analysis for HX 229. There's also a Statistical analysis. The external websites that I've linked to below also has information on this battle. According to Page 4, Polarland left New York again on March 12 and arrived Halifax on the 15th, proceeding to Argentia a few days later. Page 5 shows more 1943 voyages as well as some 1944 voyages, which continue on Page 6 and Page 7. Convoy information for some of them can be found in A. Hague's Voyage Record. In the afternoon of Jan. 4-1945 Polarland was in station 31 of Convoy SH 194 (external page), on a voyage from St. Lawrence, N.F. and Sydney, C.B. (departed St. Lawrence on Jan. 1, Sydney, C.B. on Jan. 3 - Page 7) for Halifax and Philadelphia with a cargo of 1200 tons of fluor spar, when a torpedo struck on the port side (in view of land off Halifax, about 4 n. miles away) and she sank within 15 seconds, 44 30N 63 00W. 2 men were able to throw themselves onto a raft which floated clear of the ship as she sank, another 3 came to the surface nearby and were also helped onto the raft. All the survivors had been on the poop when the attack occurred. The torpedo had come from U-1232 (Dobratz), which had also torpedoed and damaged the Canadian M/T Nipiwan Park from the same convoy shortly before Polarland was hit, and the alarm had been sounded on Polarland so that all on board had been called out. The survivors were picked up about an hour later by the Canadian mine-sweeping sloop HMCS Kentville (J-312) and landed in Halifax, where an inquiry was held on Jan. 6-1945 with all 5 survivors appearing. J. Rohwer also lists the Canadian minesweeper HDML 1163 as damaged by this U-boat. Position is given as 44 30N 63W for all 3 ships. Harry Wroldsen had previously survived the sinking of Hvoslef. Stavern Memorial commemorations - 20 are commemorated here. 1 of them, Seaman Anton Thomassen, had died on Jan. 25-1941 after an accident on board. From Page 1 of the archive documents, we learn that Polarland was on her way from Mobile to Cristobal on that date. *There's also a Mate Sigvald Andreas Eide listed - he's identical to Able Seaman Sigvald Henriksen in my crew list above; in other words, he's listed twice at the memorial, the first time with the wrong birthdate and title (this has become clear through this Guestbook message from a relative). Back to Polarland on the "Ships starting with P" page. The company later had another Polarland, built in Haugesund 1966, 12 877 gt. Became Iscelu in 1977 (Georgetown), Turkish Trakya in 1981, Trakya I of Istanbul that same year, Panama registered Lung Hao in 1989. Wrecked by typhoon Sarah near Hualien on Sept. 12-1989.